Everybody loves a rainbow, but what most people don’t know is the fact that you can actually apply all the colors contained by a rainbow to make a great diet plan. 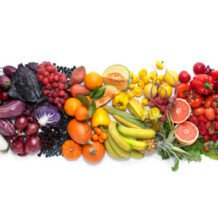 The rainbow diet uses different foods in colors of the rainbow to help you live a healthy life. All you need to do is eat a fruit or a vegetable from the 8 group colors and one extra from the orange group. White – This is the color spectrum combined so it contains some very important items. We have onions, garlic, potatoes, yams, all filled with fibers, antioxidants and vitamin C. Don’t forget to eat one item of this group everyday. Also, garlic and onion are natural remedies for a lot of illnesses so if you feel like you need to boost your immune system a bit during a diet, some onion and garlic are great methods. Red – Red is one of the most desirable colors and it has a lot of great foods you can choose from like: watermelon, tomatoes, pink grapefruit, cherries, red apples or raspberries. These are high in fiber and low in sugar so they work great for those who need to keep their fibers high but their carbohydrate level low. Purple/Blue – In the purple/blue section we have some great tasty foods like: eggplant, grapes, raisins, blackberries, blueberries, etc. These are rich in antioxidants and vitamins so you will get all the nutrients you need to stay healthy during the weight loss diet. Orange – orange is such a great color and this category also contains some amazing food items like: oranges, carrots, pumpkin, apricots, mangos, tangerines, peaches, etc. You can use them for smoothies or you can just eat them raw, these will definitely improve your skin condition and make you glow. They also contain vitamin D which is a great nutrient for your eyes, but the best thing about this category is the fact that you get to eat two items. Green – the items in the green category are full of fibers and have very few calories so they are the best option during a diet. Some of the green foods you can choose are: spinach, kiwi, broccoli, cabbage, lime, honeydew melon, etc. Yellow – if you need some more vitamin C the yellow group has plenty of it. An extremely healthy choice for snack or as a side dish would be one of the following foods: bananas, pineapple, squash, yellow peppers, lemons, etc.